A beautiful blend of dead sea mineral salts, floral oils and petals to extract impurities from the body and soak away all your worries! 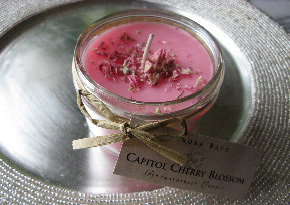 Place 1/2 c. under warm running water in tub and soak for 10-20 minutes in a soft pink bath. 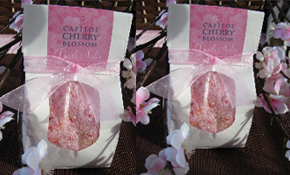 Visualize yourself in a large porcelain tub beneath the Cherry Blossom trees, a pink blizzard of petals swirling around you! My own unique creation! 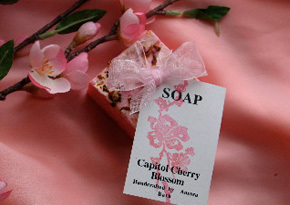 A peaceful blend of superior quality Japanese green teas with a hint of cherry added and hibiscus for a gorgeous ruby color. 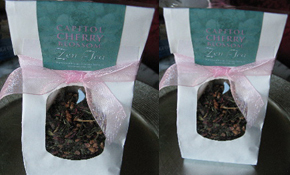 The perfect meditative tea to sip while relaxing under the blossoms and pondering the big picture! Comes with 3 reuseable cloth bags.